For many, 2017 will be defined by fake news and the fight-back against it. Others will point to the blog that uncovered sexism and sexual harassment at Uber, helping force the resignation of the ride-hailing firm’s founder and paving the way for other controversies to be uncovered. Gamers may prefer instead to celebrate Nintendo’s revival thanks to its Switch console, and motorists to highlight Elon Musk’s desire to electrify the trucking industry. But you, BBC Tech’s readers, focused your attention elsewhere – at least as far as our figures on what you clicked on suggest. Below are the stories you made most popular for each month of the year. The quiet death of 3D TV was the first of the year’s big stories. When Sony and LG unveiled their new television ranges at the CES Las Vegas tech expo, it soon became apparent none of the models supported the format. Samsung and Philips had already ditched the technology the previous year. Strictly speaking, 3D-on-the-home-screen wasn’t totally extinct – Panasonic came out with a new set in February – but a combination of consumer apathy, frumpy glasses and uninterested streaming services had clearly doomed the extra dimension. With CES 2018 just around the corner, the question is whether we’ll soon be able to call time on curved screens too. 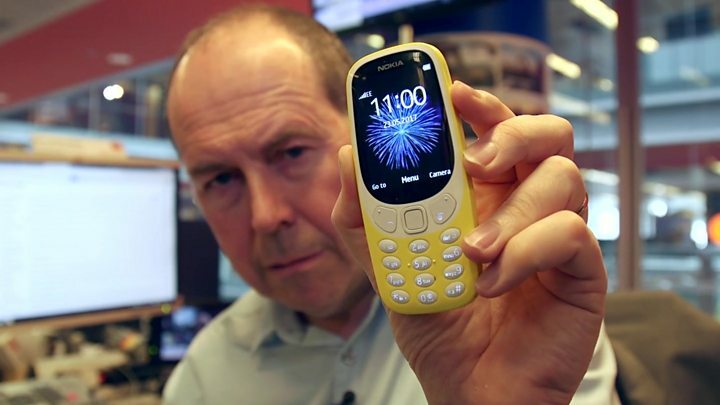 HMD Global pulled off a marketing coup when it unveiled a new Nokia-branded 2G phone with the same name as one of the most iconic models of yesteryear. The “reimagined” 3310 featured the classic game Snake, offered extended battery life and kind of resembled the original design. But it lacked access to Snapchat, WhatsApp and countless other apps. Moreover, once owners got over the nostalgia factor, they discovered the photos it took were both pixelated and hard to get off the device. Even so, there was enough demand to justify a follow-up 3G model in September, and the phones appear to have helped raise the profile of other higher-end Nokia handsets. Allegations that the CIA and MI5 had teamed up to hack Samsung TVs were made even juicier by the fact the project had apparently been given a Doctor Who-related codename. According to Wikileaks, the Weeping Angel attack caused compromised TVs to record audio when apparently switched off, before later uploading it to the cyberspies’ computer servers. Effectively, it allowed a room to be bugged without producing giveaway radio signals. One theory for the project’s name was that just like the malevolent sci-fi statues, the TVs were still “alive” even when they appeared to be inactive. Later in the year, Wikileaks published further details, including how the spyware could be uninstalled, as well as claims about other CIA-related hacking tools. Although $ 100m (£76m) might seem like pocket change to Google and Facebook, the two companies missed the funds after they – and a third business, Quanta Computer – were allegedly conned by an email fraudster. The accused is said to have faked messages from an Asian-based manufacturer and convinced his victims to wire payments to his account over a three-year period. The Lithuanian suspect, Evaldas Rimasauskas, was extradited from his home country to New York later in the year where he now faces charges for wire fraud, money laundering and aggravated identity theft. A common refrain with cyber-security alerts is that, despite there being a hullabaloo of expert opinions, there’s typically little real impact to the public. WannaCry was the exception. The ransomware attack swept across the world locking out users from tens of thousands of Windows PCs. The assault – later blamed on North Korea – forced NHS trusts in England and Scotland to cancel operations and other appointments. It was subsequently revealed that they had ignored earlier government warnings to update their systems, which could have mitigated the problem. Just a month after WannaCry, another hack attack caused chaos – and this time the damage proved to be longer-lasting. An infected tax software update sent to businesses in Ukraine spread worldwide, disrupting the operations of some of the world’s biggest companies. They included shipping firm Maersk, delivery giant FedEx, advertising conglomerate WPP and the consumer goods-maker Reckitt Benckiser. In some cases it took months before operations returned to normal, and related losses totalling more than $ 1bn were declared. Ukraine accused Russia of being responsible, but the Kremlin denied involvement. A complicating factor in reporting the cyber-strike was that the security industry struggled to settle on a name for it – with Petya, NotPetya, Pneytna, Petrwrap, SortaPetya and Goldeneye among the variants suggested. Bitcoin’s future seemed in doubt when there were rival plans mid-year to tackle a slowdown in the amount of time taken to process transactions in the virtual currency. Without delving too deeply into the proposals – you can read up on Bip 91, Bitcoin Unlimited and Segwit2x if you dare – a compromise deal was eventually struck to make the underlying technology, the blockchain, more efficient. But the plan fell apart before it had a chance to be fully enacted in November. That failure didn’t prevent Bitcoin’s value from bubbling higher. When the article in question was published, it was worth about $ 2,400 per coin. By December, it was close to $ 20,000. Slow processing times, however, remain a headache. Earlier this month, the average time taken to confirm a Bitcoin transaction was close to 24 hours. By coincidence, a fresh attempt to “hard fork” the crypto-currency, splitting it in two to address the problem, appears imminent. Marcus Hutchins never wanted to be exposed as the “Wannacry hack hero” and his name only became public after British newspapers revealed him to be cyber-security blogger Malware Tech against his will. That act carried a vicious sting in its tail when the 23 year old was arrested by the FBI after a trip to Las Vegas. The US accused him of having developed banking malware several years ago and of selling it on dark web forums – charges Mr Hutchins denies. The accusations caused fury among other cyber-security professionals, with some vowing to restrict the support they offered the authorities. Mr Hutchins is currently released on bail in Los Angeles where he is awaiting trial. In the meantime, the Trump administration recently acknowledged that it was “lucky” Mr Hutchins had thwarted Wannacry, although it avoided mentioning him by name. Curiously, a major leak about Apple’s iPhone X ahead of its official launch managed to attract more eyeballs to BBC Tech than the actual unveiling of the device itself. Details included the phone’s name, the set-up process for its facial recognition technology and the inclusion of its animated emoji characters. An extra element of schadenfreude was provided for company critics by the fact that an earlier leak had disclosed that Apple had hired ex-FBI and NSA workers to thwart such spoilers. It’s questionable whether the reveal actually dampened demand for the £1,000 handset. The US firm has forecast record sales for its current quarter. However, in recent days some analysts have begun to question how robust demand will be later in 2018. When a company gets to be Amazon’s size it has to rely on automated systems to deal with items reported as damaged or missing by their intended recipients. A US couple thought that presented them with an opportunity. They used hundreds of fake identities to order gadgets from the online retailer, reported problems that triggered replacement deliveries, and then sold on all the goods for a profit. The $ 1.2m scale of their crime, however, meant their activity had in fact been detected and they eventually pleaded guilty to mail fraud and money laundering after being arrested. Erin Joseph Finan and his wife Leah Jeannette Finan were supposed to have been sentenced in November. But that has been delayed after they were accused of defrauding another internet retailer in the months after the original charges were filed. “The future is here,” Navya’s self-driving shuttle bus had emblazoned on its side as it launched its Las Vegas pick-up service. Unfortunately, less than an hour later, that future involved a delivery lorry backing into its front. As one passenger later recounted, the “crash” seemed to occur in slow-motion and only caused superficial damage. But the story sped across the world. Although the human driver was ultimately held responsible, the police report – made public earlier this month – told a more nuanced story. The trucker said they had turned on their hazard lights and sounded a back-up alarm to warn surrounding motorists that they were straightening up the cab. It had never occurred to them that an automated vehicle would respond by remaining stationary in their path without doing more to prevent the accident. Apple may have had the best of intentions, but its love of secrecy left even some of its biggest fans shaking their heads this time round. It was only after a blog by the makers of the Geekbench app went viral that the US firm publicly confirmed it had been deliberately slowing down ageing iPhones to help manage performance issues caused by their batteries wearing out. It subsequently emerged that the firm had apparently privately briefed some analysts on the decision a year ago, but had not shared the details with its consumers. Whether those customers would really have preferred thicker handsets with bigger or swappable batteries is open to debate. But the risk it faces is that shoppers suspect it is untrustworthy. At time of writing, Apple is being sued in eight separate cases in the US over the matter, as well as facing legal action in Israel.